My name is Rodney Neel and I have been working with dogs for almost 10 years. I have always been interested in animal behavior and always wanted to work with dogs. While running my dog training school I have continued my education by attending different schools and seminars. I knew that working with animals was my passion, I wanted to learn more and gain experience in the training of working dogs. I searched out the best Dog Training School I could find. After many weeks of searching, I decided to attend K-9 Services Unlimited/Piazza’s Professional Dog Training School in Upstate NY. After talking with Mr. Sal Piazza, I was sure that this was the school for me. I attended K-9 Services Unlimited and graduated. The months that I spent at this facility were intense and physically grueling to say the least. I have learned what it takes to be a great dog trainer. It is great to have now have Sal Piazza as a friend and a mentor. He was able to show me that if you never put money first, but put the dogs and clients above all else that your business will continue to grow. Most of my training was through hands on training and worked with many different breeds of dogs and temperaments. There was never a dull moment. I received my diploma as a Police Service Dog Instructor. I also graduated from That’s My Dog E-Academy which teaches the proper way of using remote collars in all aspects of obedience dog training and their uses in solving behavior issues. I am now serving all of the Metro St. Louis/Southern Illinois area. If you are looking for a dog Instructor/Trainer who will give you and your dog personal attention, please give us a call. My experience and training are second to none. I will treat you with dignity and respect and always get the job done. I get to do what I love for a living and have the knowledge that I help problem dogs get to stay with their families instead of the problem behavior causing the family to give up and take the dog to the pound. We strongly suggest the whole family take part in the training of the dog. Problem solving: If you think your dog is great except for them: potty issues, running away, jumping on people, growling at people, pulling on the leash, excessive barking, chasing cars, bikes, dogs, guarding things, food bowl, toys, we can help you solve 1 or all these issues. Before you just accept these behaviors or give up call us we can help. Puppy Kindergarten: This course is mainly for the new dog owner or anyone that wants to raise their dog correctly. It covers potty training, proper socialization of your dog and common mistakes owners make with their dogs. 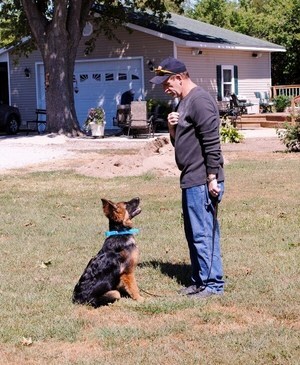 Basic Obedience: This course includes, walking nicely on a leash, sit, sit stay, down, down stay and to come when called. You will learn basic dog behavior and how to read a dog’s body language and how to properly handle a leash. Intermediate Obedience: This course includes everything that the Basic Obedience course does plus training on a long line for short distance control. It also includes proofing the dog against mild distractions. Advanced Obedience: Includes everything listed above plus a lot more. You will have off leash control of your dog. You will also learn to understand your dog’s instincts and drives and to read their body language. As long as your pup is at least 8 weeks old you will not have to wait to start their training. You can have a fully trained dog by the time he is a few months old. The following courses include Advanced Obedience. Personal Protection Dog Training: We can teach your dog once they pass a temperament test to still be the loveable and friend pet but be able to protest you and the family. This course includes advanced obedience so your personal protection dog will be well behaved and a pleasure to take with you on walks, camping or anywhere dogs are permitted and will give you some peace of mind if you have to leave your family at home alone when you are away. If this is of interest to you give us a call for details. Tracking Classes: This class is a great way to bond with your dog plus get some exercise. You will learn how a dog tracks, how conditions affect scent. If you think you might be interested in search and rescue this course is a great start. Agility: This is a great course for getting some exercise and bonding with your dog. It builds you and your dog’s confidence as you master each obstacle. (We are currently constructing some new obstacles so check back as to when the next class is available).